Dr. Lau began wearing glasses at the age of 8 and has been fascinated with vision care ever since. She has a Bachelor of Science Degree in Biology from McMaster University and completed her Doctor of Optometry at the University of Waterloo with recognition on the Dean’s Honors List for academic excellence. In school, she was president of the VOSH (Volunteer Optometric Services for Humanities) student chapter, organizing fundraisers and optometric mission trips. Dr. Lau has participated in volunteer missions to Ghana and Peru, where she helped deliver eye care to underserviced communities. Dr. Lau’s optometric training includes an Ocular Disease and Therapeutics clinical rotation at Scarborough Eye Associates. She has worked at various clinics across Canada and received training at a clinic that offers vision therapy and rehabilitation services. This is where she developed a special interest for treating binocular vision disorders. Her experience also includes working at a laser vision correction center, and she is knowledgeable about industry-leading technologies and techniques for refractive correction surgery, a procedure that she has undergone herself! 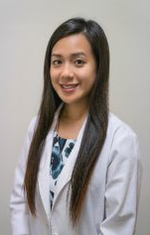 Dr. Lau speaks English, Cantonese and Mandarin, and enjoys working with patients of all ages. In her spare time, she likes to stay active by jogging, doing yoga, and spending time with her dog, Kiwi.